Do I really need to tell anyone who Laurent Gbagbo is? Just like Buhari, he was in Power and the whole world was in his hands. He would look around and nod his head; Soldiers obey him, he commands and people are slaughtered, just like President Muhammed Buhari is slaughtering Biafrans, Laurent Gbagbo was slaughtering the citizens of Ivory Coast. What was life like? Nothing will happen, he enjoys immunity, the Police wouldn’t ask him questions and neither can the Army question his command. Make sure nobody comes out and protest and if they do, slaughter them. That was his belief or command; the same command Buhari gave the Nigerian Army and police. 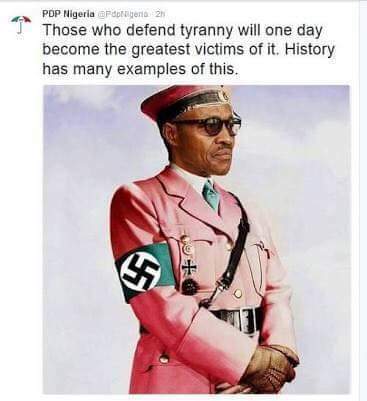 Would Muhammed Buhari learn from history? No; that is the mentality of an average African man, what has passed has passed and he doesn’t go into yesterday. Gbagbo did not play his game well; he was soft, he allowed himself to be caught, with the power he had, he could have chosen death and be strong. Who is ICC to come and question the sovereignty of Ivory Coast; Ivory Coast does what she wants and defends herself (Kill lawful and peaceful citizens for a good reason). Those peacefully and lawfully protesting youths will only destroy our Country and pose threat to national security. That is the mindset of average African leader and that is the position of Muhammed Buhari. Like Laurent Gbagbo of Ivory Coast like that of Nigeria; killing protesting citizens is their trademark. Gbagbo did not know what was coming; neither did he see it coming, power and sovereignty of Ivory Coast was everything. He has immunity and nothing would happen; he was convinced that his immunity and the sovereignty of Ivory Coast was a license to kill dissent voices. Muhammed Buhari is on that path; he would tell you that Nigeria is indivisible and that he had better drown everybody than allow referendum in Nigeria. Gbagbo would rather kill the people of Ivory Coast than allow the wish of the people which was for him to accept defeat. Muhammed Buhari has a better chance; allow referendum and continue with your Nigerian leadership, but he would not do that, he would rather launch military action against citizens. He would rather arrest and order the Judiciary not to release opposing voices. He would rather warn citizens to go inside their homes or they will be killed. He takes lives of Biafrans like they are flies; he is the strong man that everybody should fear. Buhari neglects ICC so much; he has continued to commit crimes against humanity without restraint, all because he sees ICC as a toothless dog. Why won’t he see ICC as a toothless dog when after everything he killed in 1967 genocide, nobody has questioned him? Why won’t he see ICC as a toothless dog when the post election violence he caused that took thousands of lives was swept under the carpet? Why would he not continue to kill when he is certain that ICC would eventually do same thing done all the while he had killed and committed crimes against humanity? There is another Laurent Gbagbo because everything going on is Laurent-like; there is a matter before ICC and Buhari is hopeful that as long as he is in power, nothing will happen. Laurent Gbagbo of Ivory Coast had a case; he believes that as long as he is in power, nothing will happen. Nigerian Laurent Gbagbo is killing as much as he can sight an Ivory Coast Laurent Gbagbo killed as much. They both have no regard for humanity; thousands of Shiite Muslims killed and thousands of Biafrans killed as well. In all fairness; Nigerian Laurent Gbagbo is becoming more vicious that that of Ivory Coast. Someone had argued that Buhari will not be another Laurent Gbagbo; anchoring his reason on the difference in agitation. He said that Laurent Gbagbo of Ivory Coast was a political issue; he lost election but persisted, he concluded that Ivory Coast Laurent Gbagbo was not freedom issue. He argued that Laurent Gbagbo of Nigeria is different; that citizens being killed in Nigeria have to do with sovereignty of Nigeria. He argued that difference in agitation may be decisive or rather wage actions against Laurent Gbagbo of Nigeria. It is imperative to know that there is no condition or law that gives anyone right to commit crime against humanity. The nature Laurent Gbagbo of Nigeria is going about peaceful agitation calling for referendum is unwarranted. I have watched videos uploaded by Amnesty International and it can best be described as genocide against unarmed agitators. Laurent Gbagbo of Ivory Coast used that same measure against citizens in Ivory Coast, had he not been stopped, thousands would have gone by now, depreciating humanity for no just cause. Laurent Gbagbo of Nigeria is now due to be stopped before humanity is extinguished in this part of the world. There are tremendous evidences against him and the more he is left; the more humanity is risked. He has no respect for human life but enjoys his own, fly abroad when sick to save his own life. Laurent Gbagbo of Nigeria like that of Ivory Coast would surround himself with Soldiers against death but give death to citizens. Do not call me a prophet of doom because I can see Nigerian Laurent Gbagbo, when the gods want to kill a man, they first make him mad. The gods want to kill Laurent Gbagbo of Nigeria and this is why they have blinded his eyes, knocked his sense that he kills like Hitler, kills his conscience that he has no pity and made him unrepentant that he can’t stop killing.